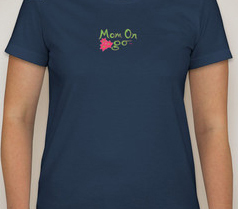 Mom On go t-shirt displays Mom On go on the front and "try to keep up" on the back. This t-shirt runs small. Navy blue with hot pink and lime green graphics.